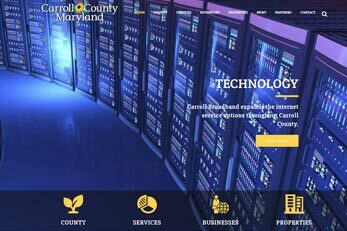 The Carroll County Department of Economic Development is pleased to announce the launch of its newly designed website http://carrollbiz.org. Highlighting county demographics, featured properties, department services and development news, the website is designed to capture the attention of site selectors and brokers looking for relocation or expansion areas. “Carroll County is strategically positioned for regional growth opportunities for small to mid-size companies looking to capitalize on our lower property costs and productive workforce,” said Economic Development Director Jack Lyburn. “We are currently working on several new projects – a combination of existing expansions and new prospects that find Carroll County very attractive. Our new website will help us to tell our story and showcase these positive developments,” Lyburn added. Newly added features of the website include interactive maps of select major employers, business parks and major retail locations. Businesses can also elect to submit news they want to share. Website sections include education, infrastructure, and quality of life information accompanied by links to area business associations and regional partners. Website visitors are able to sign up for electronic newsletters and read the latest Twitter announcements in the news feed that is featured on the sites home page. Easy contact with the department is available through a contact form and the website is optimized for convenient mobile access. The Carroll County Department of Economic Development is a results-oriented team that creates competitive business solutions. To learn more about the programs or opportunities available in Carroll County email info@carrollbiz.org, visit http://carrollbiz.org, follow @CarrollEconDev on Twitter or call 410-386-2070.